Michael gets his Bachelor&apos;s Degree from ASU. It seems like every spring, my husband Michael has a graduation. Actually, he's had them in the fall, too. He had one last year, and one the year before. Or a few months before, I forget. Two of them were for Associates' degrees, obtained from Glendale Community College. This was a bigger deal, his Bachelor's degree from Arizona State University. As was befitting something that took every waking moment for the past two years or so, his commencement was an intimate affair, held at the Wells Fargo arena. Obviously, I'm using the word "intimate" guardedly. But at least the commencement wasn't held next door at the Sun Devil's stadium! I've completely given up trying to get a close-up photo of Michael receiving his diploma at these things. I mean, besides the fact that graduates don't actually get their diplomas at the commencement; they get a blank sheet of paper gussied up to look like a diploma. 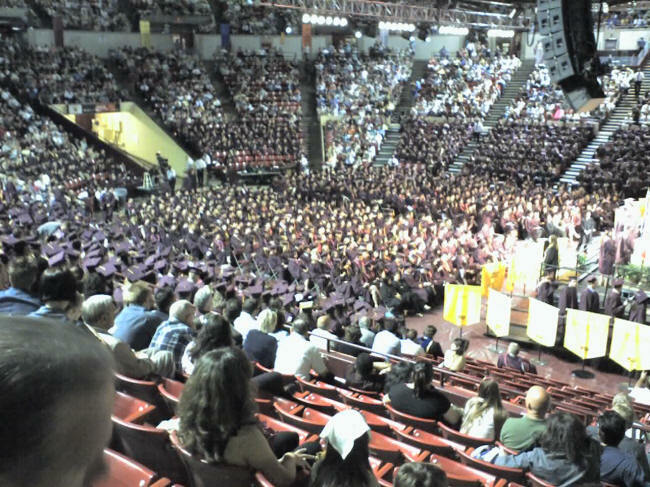 But, as you can see from the mob in the photo, there is no possibility of getting a close-up of one's graduate. For that matter, there's little possibility of getting into the rest room. Fortunately, they have made arrangements for a professional photographer to capture the special moment; and in a week or so, we are supposed to be sent "proofs" and a price list. So at that point, I'll be able to update this entry with Michael's photo. How will we pass the time in between? I know—let's take a cruise to the Western Caribbean! We leave tomorrow. I hope/expect to be blogging during our trip, so stay tuned! Same Bat-time, same Bat-channel.